The average Buffalo Sabres Vs Tampa Bay Lightning tickets will cost you $208 for the event being held on 21/02/2019 at Amalie Arena, Tampa. 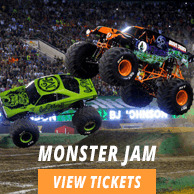 The minimum get in price is $23 at Amalie Arena. Can I book my lightning sabres tickets in advance from you? Where can i look for promo code for buffalo sabres vs tampa bay tickets ? Buffalo Sabres Vs Tampa Bay Lightning Tickets can very well be booked in advance. You can get your code for Tampa Bay Lightning tickets from our Live Help Rep.